More than 100 militants have stormed a security checkpoint in north-western Pakistan, killing at least eight soldiers, officials say. At least 12 insurgents were also reported killed in the overnight gun battle that lasted some hours. The attack happened near the town of Makeen in the tribal district of South Waziristan, near the Afghan border. The area has seen a surge in missile strikes by US drone planes in recent days. Only a few days ago, locals and officials said a US drone attack in South Waziristan had killed a top al-Qaeda militant, Ilyas Kashmiri. Tension has been increasing across the whole border region because of a growing sense that Pakistan is preparing to carry out at least a limited offensive in North Waziristan, the BBC's Aleem Maqbool in Islamabad reports. Local officials said the militants - armed with rockets and heavy weapons - stormed the checkpoint shortly after midnight, killing eight soldiers and injuring around a dozen more. The attack in South Waziristan comes amid escalating violence in north-west Pakistan since the 2 May killing of Osama Bin Laden. There have been several major attacks by militants on police and military targets, both in the north-west and in the southern city of Karachi. Meanwhile, US-operated drones have been raining down missiles on suspected militant hideouts in the Waziristan region, where the Haqqani network is based. Since Bin Laden's death, Pakistan has come under increasing US pressure to eliminate militant bases. While some of the militant attacks may have been conducted to avenge Bin Laden's killing - as some Taliban sources have claimed - others may well be meant to forestall Pakistani plans for an operation in North Waziristan. The Pakistani Taliban appears to be trying to shift international focus from Waziristan to Mohmand, from where many attacks have originated in recent weeks. 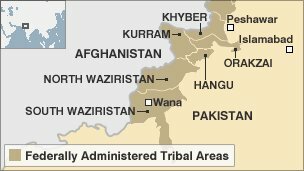 There are also indications that militant groups in Waziristan are reshuffling positions and relocating command centres to avoid a direct hit. Security forces responded and the firefight continued for at least three hours, reportedly killing around 12 insurgents. Some reports say the militants were from the Taliban. There is no independent confirmation as media access to the area is denied. The attack happened in the Marobi village area, some 12km (7 miles) east of Makeen town, once a stronghold of the Tehrik-e-Taliban Pakistan (TTP) leadership, close to the border with North Waziristan. This is the first large-scale assault by militants on a Pakistani target in several months, although smaller attacks on the military have been reported from the area on a regular basis. Militants in Pakistan have vowed to avenge the reported killing of Ilyas Kashmiri, as well as the death of al-Qaeda leader Osama Bin Laden, who was killed by US forces in the garrison town of Abbottabad, north of Islamabad, on 2 May. Many militants are believed to be sheltering in the semi-autonomous tribal regions of North and South Waziristan. They range from the TTP, which focuses on attacks inside Pakistan, to the Haqqani network, which is intent on fighting Nato-led forces across the border in Afghanistan. The area has been described by the US as the "most dangerous place on Earth". Washington is thought to have renewed calls for Pakistan to take action in those areas as it seeks to build on the momentum it believes has been created following the killing of Bin Laden, our correspondent says.